Project management is the discipline of planning, organizing, motivating, and controlling resources to achieve specific goals. A project is a temporary endeavor with a defined beginning and end (usually time-constrained, and often constrained by funding or deliverables), undertaken to meet unique goals and objectives, typically to bring about beneficial change or added value. The temporary nature of projects stands in contrast with business as usual (or operations), which are repetitive, permanent, or semi-permanent functional activities to produce products or services. In practice, the management of these two systems is often quite different, and as such requires the development of distinct technical skills and management strategies. There are a number of approaches to managing project activities including lean, iterative, incremental, and phased approaches. Not all projects will have every stage, as projects can be terminated before they reach completion. Some projects do not follow a structured planning and/or monitoring process. And some projects will go through steps 2, 3 and 4 multiple times. Many industries use variations of these project stages. For example, when working on a brick-and-mortar design and construction, projects will typically progress through stages like pre-planning, conceptual design, schematic design, design development, construction drawings (or contract documents), and construction administration. In software development, this approach is often known as the waterfall model, i.e., one series of tasks after another in linear sequence. In software development many organizations have adapted the Rational Unified Process (RUP) to fit this methodology, although RUP does not require or explicitly recommend this practice. Waterfall development works well for small, well defined projects, but often fails in larger projects of undefined and ambiguous nature. The Cone of Uncertainty explains some of this as the planning made on the initial phase of the project suffers from a high degree of uncertainty. This becomes especially true as software development is often the realization of a new or novel product. In projects where requirements have not been finalized and can change, requirements management is used to develop an accurate and complete definition of the behavior of software that can serve as the basis for software development. While the terms may differ from industry to industry, the actual stages typically follow common steps to problem solving—"defining the problem, weighing options, choosing a path, implementation and evaluation." 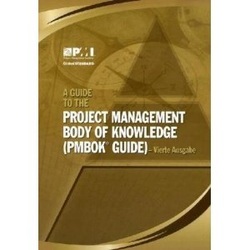 A Guide to the Project Management Body of Knowledge (PMBOK Guide) is a book which presents a set of standard terminology and guidelines for project management. The Fifth Edition (2013) is the document resulting from work overseen by the Project Management Institute (PMI). The American National Standards Institute (ANSI) which assigns standards in the USA, assigned it (ANSI/PMI 99-001-2008) the Institute of Electrical and Electronics Engineers assigned it IEEE 1490-2011 for project management to PMI guidelines. A Guide to the Project Management Body of Knowledge (PMBOK Guide) was first published by the Project Management Institute (PMI) as a white paper in 1983 in an attempt to document and standardize generally accepted project management information and practices. The first edition was published in 1996 followed by the second edition in 2000. In 2004, the PMBOK Guide — Third Edition was published with major changes from the previous editions. The latest English-language PMBOK Guide — Fifth Edition was released on 2013. A Guide to the Project Management Body of Knowledge - Fifth Edition provides guidelines for managing individual projects and defines project management related concepts. It also describes the project management life cycle and its related processes, as well as the project life cycle. Each of the ten knowledge areas contains the processes that need to be accomplished within its discipline in order to achieve an effective project management program. Each of these processes also falls into one of the five basic process groups, creating a matrix structure such that every process can be related to one knowledge area and one process group. PMP — Project Management certification based in part on the PMBOK Guide. PRINCE2 — Alternative project management methodology.